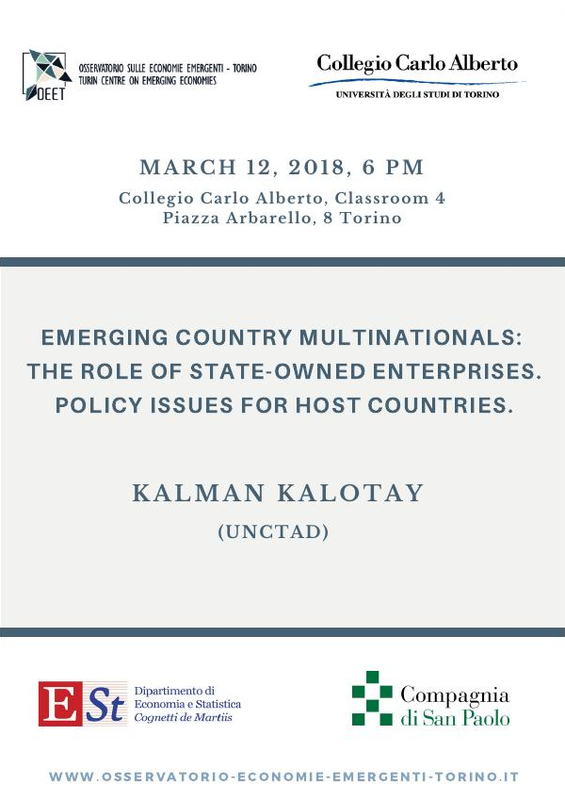 OEET is happy to announce the seminar of Kalman Kalotay (UNCTAD) on "Emerging countries multinationals: the role of State-Owned Enterprises. Policy issues for host countries". It will take place on March 12, 2018, at 6 pm, in room 4, Collegio Carlo Alberto, Piazza Arbarello 8, Torino. 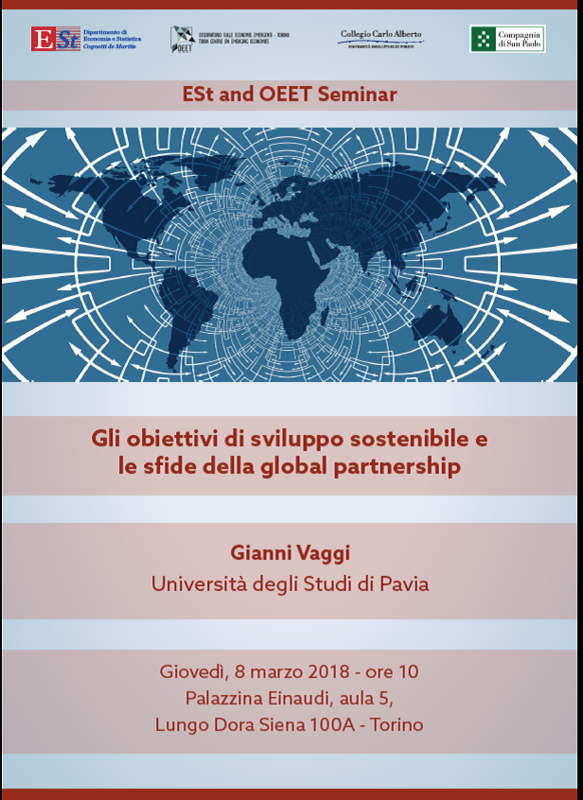 OEET è lieto di annunciare il seminario di Gianni Vaggi (Università di Pavia) , dal titolo "Gli obiettivi di sviluppo sostenibile e le sfide della global partnership" . 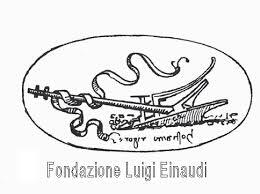 Il seminario avrà luogo Giovedì 8 marzo 2018, alle ore 10, Palazzina Einaudi, Aula 5, Lungo Dora 100, Torino. 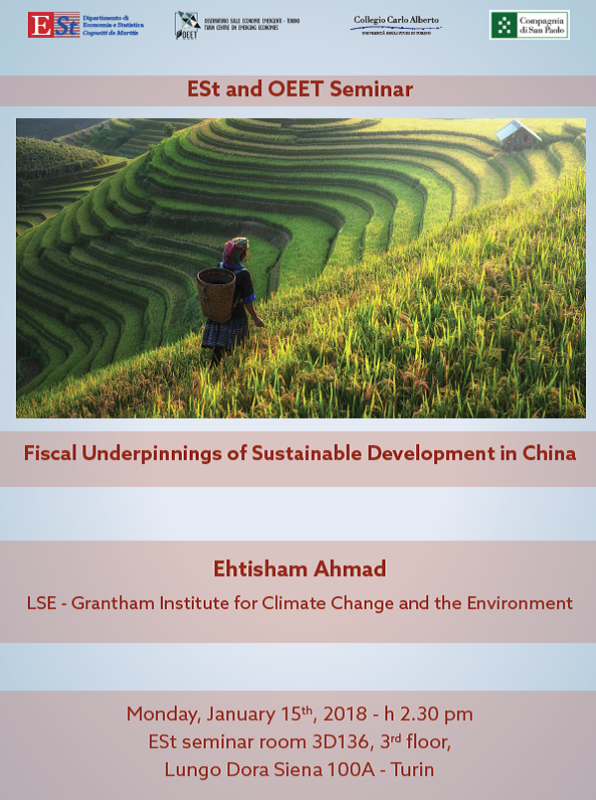 OEET is happy to announce the seminar of Ehtisham Ahmad (LSE & Grantham Institute for Climate Change and the Environment) on "Fiscal Underpinnings of Sustainable Development in China". It will take place on January 15, 2018, at 2.30 pm, in room 3D136 (seminar room), third floor, Campus Luigi Einaudi, Torino. 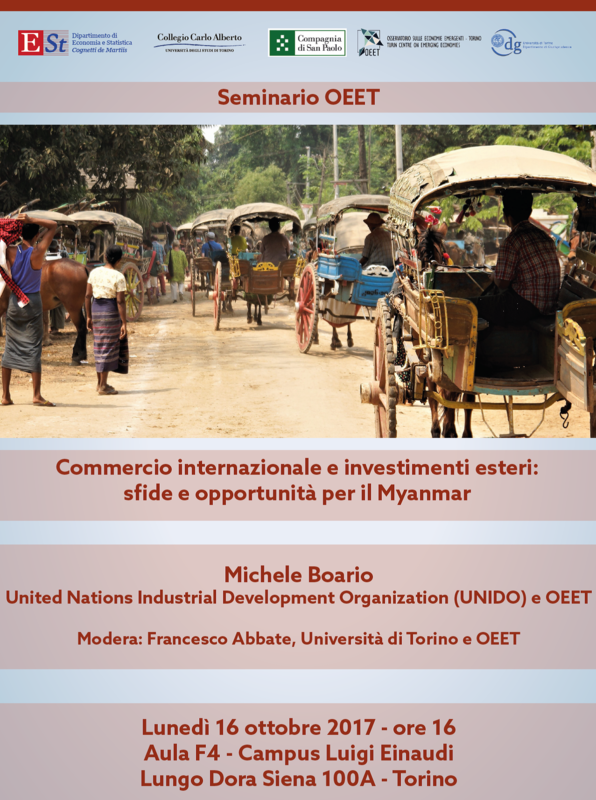 OEET è lieto di annunciare il seminario di Michele Boario (United Nations Industrial Development Organization-UNIDO) , dal titolo "Commercio internazionale e investimenti esteri: sfide e opportunità per il Myanmar" . Il seminario avrà luogo lunedì 16 ottobre 2017, alle ore 16, aula F4, Campus Luigi Einaudi, Lungo Dora 100, Torino. 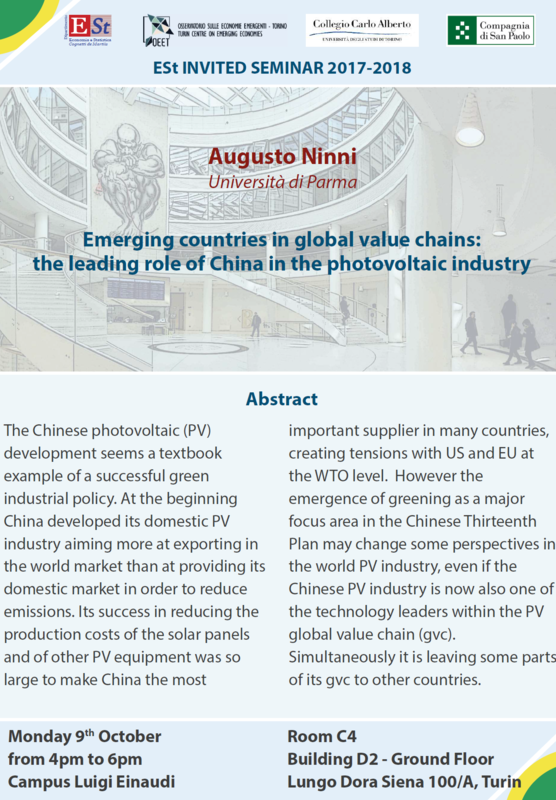 OEET is appy to announce the seminar of Prof. Augusto Ninni (University of Parma) on “Emerging countries in global value chains: the leading role of China in the photovoltaic industry". 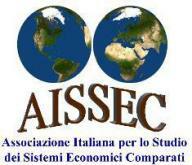 It will take place on October 9 2017, at 4pm, in room C4, ground floor, Campus Luigi Einaudi, Torino.